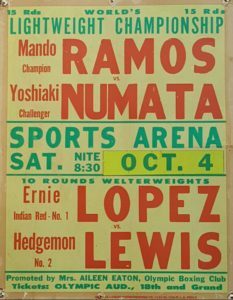 I first met Armando (Mando) Ramos in the fall of 1969, when I drove to Santa Monica to watch him train at the Surf Rider Hotel in his preparation to defend his Lightweight title against Yoshiaki Numata. What I saw was, not a fighter in serious training. 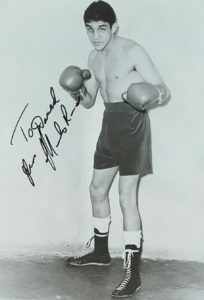 Earlier that year Ramos won the Lightweight Championship via knockout over Teo Cruz, to become the youngest to win the Lightweight title at the age of 20 years old. But, to my surprise, I found trainer Jackie McCoy completely frustrated with Mando and his lack of concentration in the gym. He verbally chastised Mando and scowled at him for his poor training practices. That was my initial contact with Mando Ramos, which was like a teacher bawling out a student. I am very saddened to report that former Lightweight Champion (my friend) Mando Ramos has passed away at his home in San Pedro. preparation to defend his Lightweight title against Yoshiaki Numata. a teacher bawling out a student.